﻿ Agave americana var. 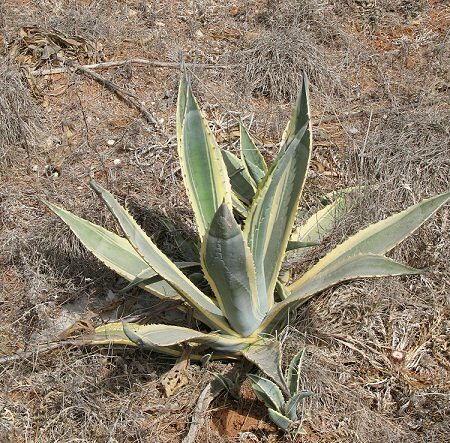 marginata (Agave) : MaltaWildPlants.com - the online Flora of the Maltese Islands. Introduced as an ornamental plant and naturalised in several wild habitats namely by the coast. Examples include Bahar ic-Caghaq (near Maghtab), Ghar Lapsi and Ta' Cenc. Very similar to Agave americana but this have leaves with yellow margins. Very robust, stoloniferous herb; stem scarcely developed. Leaves 1-2 m × 15-25 cm, constricted above the broad, sheathing base, glaucous, remotely spinose-dentate, with a stout, blackish terminal spine 2-3 cm long. Differs from var. americana by having leaves with yellow border (or variegated). Scape (including inflorescence) 4-7(-10) m. Peduncle 8-15 cm in diameter, woody at maturity, equal to or shorter than the panicle, bearing triangular, leaf-like bracts. Panicle pyramidal; flowers aggregated in dense clusters at the ends of horizontal branches; leafy buds sometimes present in axils of bracteoles, replacing some or all of the flowers. Flowers (including ovary) 70-90 mm; perianth-segments linear-oblong, obtuse, erect, greenish-yellow. Filaments 70-80 mm, inserted on the hypanthial tube; anthers 30-35 mm. Capsule oblong, trigonous.